Hello I am the Mansion with 5 Suites in Maracaípe, and I want to introduce myself to you traveler, who likes to stay with much comfort and convenience. 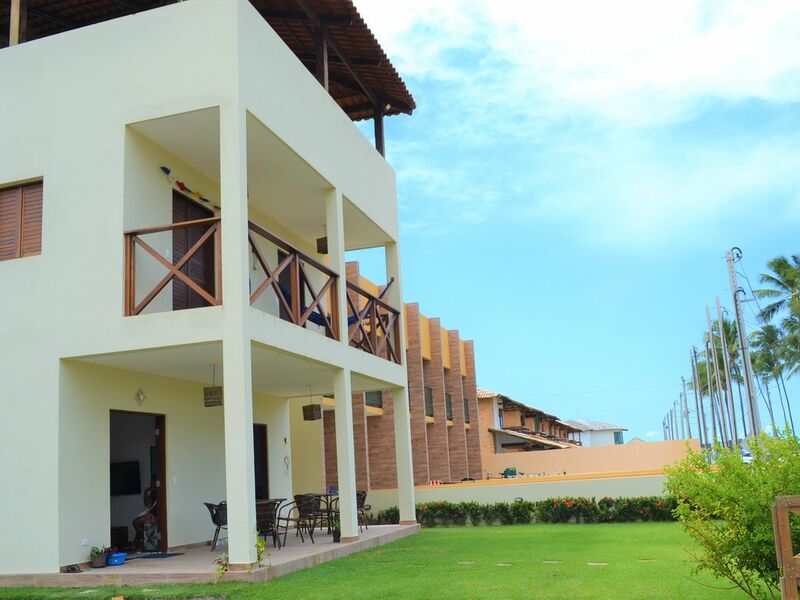 I like to receive especially large families and therefore, I am newly built and very well designed, overlooking the sea, and only 100 meters from the sea of ​​the famous Maracaípe beach. I am located in front of the pleasant village of Todos os Santos, surrounded by residential houses and good neighborhood. I have 3 floors with a beautiful garden in front, and I have a very tasteful decoration, with quality linings, hardwood, large windows, very airy and with details that you will love. On the ground floor I have a large balcony with a large garden with access to service area that has a shower, clothesline and washcloth, a super cozy living room with signed oil paintings, which give the house a feeling of lightness and well -In the living room I have a 42 'LED TV and a 4-seater sofa. Still on this floor I own, dining room for 6 seats and a very complete kitchen with all the utensils and electros necessary for long and short stays. The first suite of the house, with 1 Double Box Bed and 1 Single Bed Box, Split Air, Fan and Wardrobe. The ensuite bathroom is full, shower with hot water, blindex box and hygienic shower and a charming wash basement support. On the first floor, I have 4 more suites, two of them with sea view, Casal box bed, one of them with another single box, support puffs, wardrobe and a large ventilated balcony with hammocks. One of the Front Suites has 32 "LED TV. The rear suites are comprised of a double box bed and a single bunk bed each, Split Air, fan, support Puffs and wardrobe. The bathrooms in each suite offer the same bathroom utensils, shower with hot water, shower box, hygienic shower and toilet. On the 2nd floor, I will surprise you with the best space! A large gourmet leisure area with barbecue 5 tables with 20 chairs, hammocks and a beautiful 360º view of the sea. For your comfort, I have yet another complete bathroom! It's lovely to spend the late afternoon watching the sunset and gathering a group of friends or family. The coverage of this house (Gourmet area) is super ventilated and gives the privacy to the guest who wants rest or even gather family and friends for a barbecue. Come stay at the Mansion designed especially to welcome large families and friends with much comfort and refinement. all bathrooms with shower box and hot shower, toilet, countertop with sink and mirror of high standard, only the Wash does not have shower. A casa é ótima para receber família grande ou grupo grande de amigos. Acho que só falta uma piscina para enrolar as crianças a noite, mas isso passa batido tranquilamente. Acordar com vista do mar e a tranquilidade de maracaípe valem a pena. Distante 5 min de carro ou uber do centro de porto de galinhas. Durante o dia dar para ir andando pela praia até as piscinas naturais do pontal de maracaípe (500 metros) e porto de galinhas (2km). Ou ir de carro, mas aconselho a caminhada, vale a pena. Casa muito boa, muito bem localizada, excelente e moderna estrutura. Prezado André agradecemos muito a sua avaliação 5 estrelas. A casa realmente é excelente, foi projetada para receber hóspedes como vocês! Obrigada e voltem sempre! Casa Nova, bem localizada, ventilada, estava tudo como descrito no site. Casa Nova com boas instalações, ventilada, bem localizada, uma vista linda da área de lazer na cobertura, ótimos quartos e cozinha completa para fazer grandes almoços, boa para levar a família e ir com casais amigos. Recomendo. Adoramos hospedar voces em nossa propriedade. Ficamos felizes que gostou, pois este o nosso mais novo imóvel , com qualidade e excelente localização para grandes familias como a sua. Teremos prazer em recebe-la novamente em um dos nossos imóveis na proxima viagem. Vide nosso microsite para voltar a se hospedar conosco. The property is new and located in the heart of Maracaipe, near Porto de Galinhas village, very quiet and family friendly. Great for enjoying nature and the sea. The street is quiet and opposite the gallery of the village of all saints with bars and restaurants. It is 100 meters from the beachfront, with inns and hotels. RECOMENDAÇÃO: Verificar a disponibilidade do imóvel antes da consulta. CHECK-IN sempre após 16:00h CHECK-OUT sempre antes das 11:00h INFORMAÇÃO ÚTIL: O Imóvel é entregue limpo, com roupas de cama e banho trocadas, limpas e passadas.Nas mesmas condições deve ser entregue para o hóspede seguinte, para tanto é cobrado a taxa de Limpeza/Vistoria e Enxoval. A Energia será lida no contador na entrada e na saida e cobrada na base de 0,80Kwh, abatendo da caução.